Next award for TT-Thermo King – Bus Dealer of the Year 2018! At the yearly Thermo King Dealer Principals Conference, held this time in Abu Dhabi, in January 2019, TT-Thermo King Sp. z o.o., was awarded with a prestigious Bus Dealer of the Year 2018 title. Read more … Next award for TT-Thermo King – Bus Dealer of the Year 2018! We kindly encourage you to getting acquainted with the press releases devoted to the Authorised Volvo Trucks and Renault Trucks Service Centre, which started its operation in January 2019 at the TT-Thermo King Białystok premises. 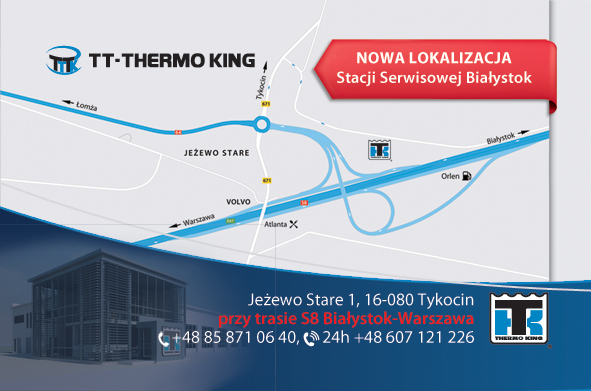 It is with a great pleasure that we inform about the acknowledgement from Volvo Polska of the highest professional standards of the TT-Thermo King Sp. z o.o. service network. And yet again TT-Thermo King took part at the International Public Transport Show TRANSEXPO 2018, which took place in Kielce between Oct. 23rd and Oct.25th.